The first bite of flourless chocolate cake and you’re wondering just what flour ever did for cake anyway. If it’s done right, the fudgy goodness will coat your fork, and possibly your teeth a little as well. Just don’t smile at your date. M’s Pub does flourless in the form of a Mocha Fudge Torte, swimming in a luscious strawberry amaretto sauce and topped with airy whipped cream. Firm and fudgy, the torte is perfect to split, but you risk having to battle your beloved for the last bite. 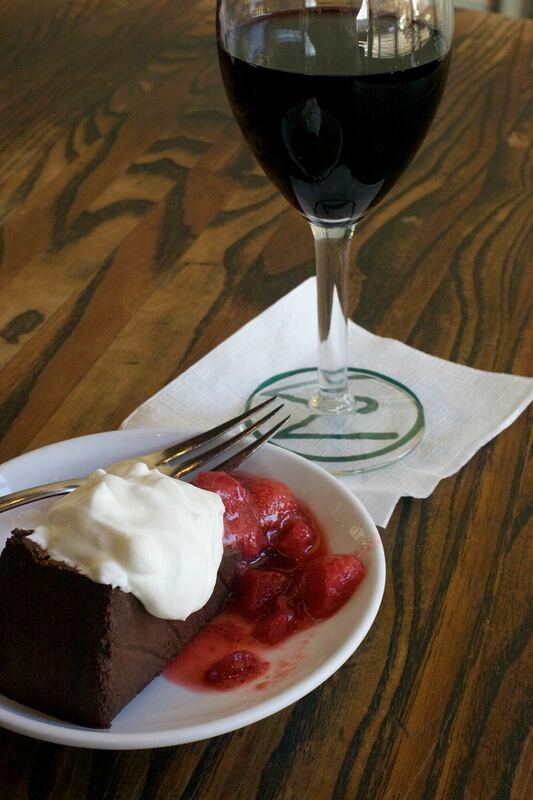 At Brix Wine Bistro at Village Pointe, two generous triangles of fluffy flourless cake rest atop a drizzle of chocolate ganache and raspberries. While others scurried around sampling the 64 wines from special vacuum-sealed bottles, I just had to be a rebel and order a beer. Breckenridge Brewery’s Vanilla Porter provided a nice complement to the Chantilly whipped cream, which was also flavored with vanilla. V. Mertz offers flourless cake in bite-sized circles, alternating with bites of devil’s food, mascarpone mousse, raspberry and fresh mint. With this one, take a sip – or a swig – of their signature Manhattan cocktail, enhanced with Ruby Port and Crème de Cassis. All over town, pastry chefs unite in their love of berries and cream with their flourless chocolate. Best yet, the dish is usually completely gluten-free, and you won’t miss the white powdery stuff at all. Bliss Bakery in the Old Market offers a flourless chocolate soufflé cake; Trader Joe’s and Whole foods both offer swell versions to take home as well. Luckily, even the kitchen challenged like myself can have a go at baking this elegant dessert at home. In general, for a fluffier cake, beat the egg whites. If a dense, fudgy torte is what you crave, don’t separate the eggs. Additions such as liqueurs and espresso grinds can make your cake unique, too. Slowly melt butter and chocolate together. Let cool slightly and whisk in the egg yolks. In a large bowl, beat egg whites until soft peaks form. Gradually add the sugar, and continue beating until glossy stiff peaks form. Whisk 1/4 of the egg whites into the chocolate mixture; then gently fold in remaining egg whites. Pour batter into 9-inch springform pan (butter the bottom and sides first), and smooth the top. Bake 45 to 50 minutes at 275 degrees. Let cool before serving. Grab a whisk and a dash of elbow grease and whip your own cream. Pour a glass or two of Port. Enjoy.